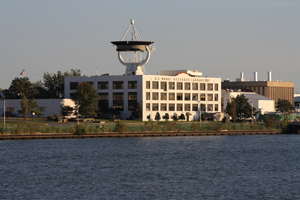 A major research center of the U.S. Navy is located on the Potomac directly north of Blue Plains. NRL opened in 1923, adjacent to the Washington Navy Yard's Bellevue Magazine, which it absorbed in 1962. The center includes 131 acres along the Potomac River. The U.S. Navy is one of the largest employers in the Washington Area, and has several large facilities along the Potomac. The oldest site is the Washington Navy Yard, first established in 1799 by President John Quincy Adams. Other Navy sites include the Carderock Division Naval Surface Warfare Center upstream in Potomac, Md., the Indian Head Naval Surface Warfare Center in Charles County, Md. ; and the Dahlgren Naval Surface Weapons Center on the lower Potomac.